At Washington Square Park, the “Tisch Fountain” Plaques Arrive! One of the many controversial, widely disliked aspects of New York City’s redesign of Washington Square Park is the renaming of the century old — here-to-fore unnamed — fountain, its name sold off to the Tisch Family for $2.5 million. This agreement, between the Parks Department and the Tisch Foundation, took place in January 2005. Yet, in another instance of its duplicitous and non-transparent agenda, the New York City Parks Department, under the direction of Commissioner Adrian Benepe, withheld this information from Community Board 2, the New York City Council and the Landmarks Preservation Commission. It was only when a community member and activist had the foresight to file a Freedom of Information Letter (FOIL) Request that the information was revealed. The Tisches have their names on more than enough NYU buildings in the area. Did they really need their name on the Washington Square Park Fountain? There are so many famous and noted people affiliated with Washington Square Park, imagine if they had offered to name it one of those – Henry James, Bob Dylan, Mark Twain, Edith Wharton, Eleanor Roosevelt – and left their giant egos at the … fence? The plaque reads: “The restoration of the Fountain and Plaza was made possible by the families of Laurence A. Tisch and Preston R. Tisch.” I mean, c’mon. If the city had “renovated” Washington Square Park as requested, and not reconstructed every last inch of it, don’t ya think the city could have paid for it with our own funds and left the Tisches out of it? Of course, that doesn’t work with Mayor Bloomberg‘s privatization agenda. And yet the Tisch Family paid a paltry $2.5 million to get their name – arguably – forever on the Washington Square Park Fountain? ** This plaque (one of two) is awaiting its installation on the aligned, leveled off fountain. Update: Thanks to Curbed for linking to this site … check out the interesting comments over there. Metro NY’s Patrick Arden’s consistent coverage of what’s going on in our City’s Parks is always spot on. In today’s Metro, he covers the NYC Parks Department – via the Central Park Conservancy – allowing a “traveling advertisement for the Chanel handbag” in the middle of Central Park this fall. 1. Brooklyn Bridge: McDonald’s can paint the arches golden. 2. Ellis Island: Presented by your local immigration attorney. 3. Washington Square: Sell it to NYU (oops, that’s happened). * Read Metro’s full story here. * New York Times “slide show” of the future “exhibit” which is equal parts art/spaceship/Chanel handbag ad. *Toyota gets its own park in the East Village! Curbed and the New York Times report on the Toyota Children’s Learning Center (photo) on East 11th Street. The landscape architect told the Times, “The notion of the Toyota Garden is of learning and discovering.” But as Curbed noted, “Discovering the joys … of driving a Toyota!” In addition: “The park was spearheaded by Bette Midler’s New York Restoration Project, and the opening was accompanied by a VIP gala in Tompkins Square Park.” The New York City Parks Department hands oversight of certain parks and community gardens over to New York Restoration Project. I read the The New York Times article first and there was no reference to Toyota’s monetary involvement so I naively sat there pondering … could this park really be named for Toyota, the car company? Then it was confirmed that, yes, it is. *The New York City Police Department wants to place the 110th Precinct IN Flushing Meadows-Corona Park in Queens. As the New York Sun reports, this is NOT to oversee the park but the whole district – to take the place of the precinct currently on 43rd Avenue. It’s hard to imagine there is no other location in Flushing, Queens that the NYPD could utilize versus putting a police precinct within a park, which should be open, public space. *At Randalls Island: The New York Times reports that despite a court ruling last year stating that NYC – against the wishes of Mayor Bloomberg and NYC Parks Commissioner Adrian Benepe – could not “grant [20 private] schools priority in using the [athletic] fields in exchange for $45 million,” construction of the fields continued. Now, a new ruling states that the city can continue building (even though they had been – ?) but they still can’t utilize money from the private schools. Where the money for the construction is coming from, no one knows. Commissioner Benepe stated, “We are pleased that today’s decision lifts a cloud over this important endeavor.” The NYC Parks Department seems to have a lot of clouds over their endeavors since most every project they put forth encounters a lawsuit by communities attempting to stop them. *Reverend Dr. Donna Schaper, Senior Minister of Judson Memorial Church and author, writes about privatization and parks in “When is a Gate Not a Gate” in this month’s Brooklyn Rail. She relates an experience she had ‘sneaking’ into Gramercy Park (which is a private private park — the park is only ‘accessible’ to the nearby neighbors whose buildings line the park). In discussing how Gramercy Park is open three days a year to the public, she comments that sometimes it doesn’t even open on those days, much to the confusion and disappointment of those awaiting these brief opportunities. Mark Your Calendars: On Sunday, June 1st at 7 p.m., Matt Davis, who supplied this photo of the trees in the process of being destroyed and has shared much of his knowledge, will screen his documentary “SQUARE: Straightening Out Washington Square Park.” In it, he chronicles the City’s redesign plans over a four year period — how the dramatic “renovation” of Washington Square Park got pushed through, and past, an outraged community. The film, with musical guests, will be shown at the Bowery Poetry Club, 308 Bowery at Bleecker. More details to follow. Three more stately old trees were felled at Washington Square Park this morning. When will it end? 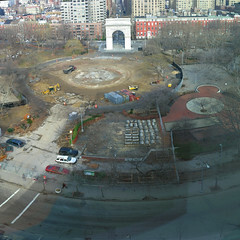 The total number of trees at Washington Square Park which have met the fate of the men with the chain saws is now fourteen. I highly doubt – despite what NYC Parks Commissioner Benepe would say – that these trees were “dying” or “dead.” They were likely in the way of the City’s redesign plan. Beautiful mature 80 year old trees are chopped down one morning by a man with an ax directed by the misguided whimsy of a city government to redesign a highly functioning public space to better fit in with our CEO Mayor’s “vision” for our city. There’s something criminal and outrageous about that. The New York City Parks Department Budget Hearing is coming up before New York City Council tomorrow Thursday, May 22nd. If you can swing by, please come to City Hall and advocate for our Parks/public spaces. Perhaps if the Parks Department was better funded, we wouldn’t be seeing so many of their privatization games (for example, Washington Square Park Fountain sold off to the Tisch Family with naming rights for $2.5 million). Important data: City Parks take up 14% of City land and yet the Parks Department receives less than 1/2 of 1 percent of the City budget. Parks workers have been cut by 66% over the last twenty years. Come to City Hall Council Chambers — 1:30-3 p.m. 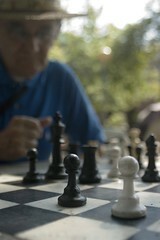 Parks Department Presentation (a chance to see Commissioner Benepe in action); 3 p.m. Public Comment. A $7 million private donation to the project from an anonymous source is based in part on construction of the [restaurant] concession, a [Union Square] partnership spokesman confirmed yesterday. So why can a private donor give money only on condition that a portion of a public park become a private concession? The fire sale of public space for private business deals has become all too common in the Bloomberg era. Mullaly Park in the Bronx was sacrificed for the new Yankee Stadium. Randalls Island was turned over first for a water park concession, but the deal later collapsed. Then there was a deal to give rich private schools preference on using the island’s ballfields. A Supreme Court justice voided that deal and the city has appealed. The article also revealed something I did not know. Restauranteur Danny Meyer — who is presently co-chair of the Union Square Partnership (the local business improvement district/BID) which controls much of Union Square Park already — was “a founder and director of the Madison Square Park Conservancy” at the time he was given concession space within that park. That concession is the “popular” Shake Shack in Madison Square Park. Meyer, who owns Union Square Cafe and Gramercy Tavern, also heads the Union Square Partnership and is a major promoter of the $20 million renovation. Meyer has sworn under oath he would not bid to run a restaurant in Union Square Park. That’s not the question. The question is when will Mayor Bloomberg stop giving his rich friends city parkland? And let’s not forget the plans for the naming of the Fountain in Washington Square Park “Tisch Fountain” which occurred after the Tisch Family made a $2.5 million “donation” to the Mayor’s Fund to Advance New York City. When: Friday, April 25th, 6-8 p.m. 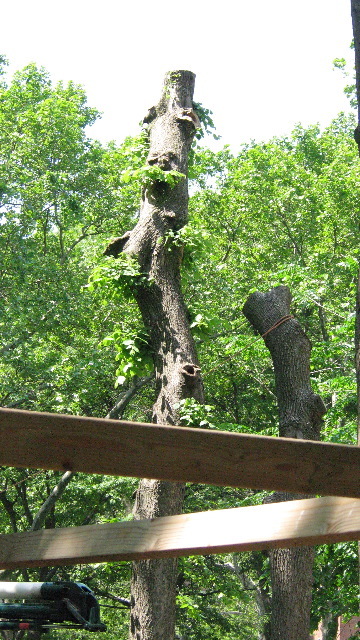 Despite Mayor Bloomberg’s hyping of his “MillionTreesNYC” P.R. initiative, thousands of mature trees have been cut down in all five boroughs at our City’s Parks, mostly in the interest of privatization of public space, which has dramatically increased under Mayor Bloomberg. Under the Bloomberg Administration and NYC Parks Commissioner Adrian Benepe, the plans (stopped at the moment by a Temporary Restraining Order) move forward for Union Square Park to lose a large portion of its public space and 13 mature trees in order to accommodate a private restauranteur. Since Friday, April 25th is Arbor Day, a day in which we celebrate, nurture, and plant trees (the first Arbor Day took place in 1872), we thought it a perfect day to look at Mayor Bloomberg’s true legacy on trees in our city, particularly in our Parks. As Union Square Park is the latest Park being descended upon by the Bloomberg Administration, we plan to gather there. BRING ART, CREATE ART, DRESS UP. on the north end for restauranteur Danny Meyer (co-chair of the local BID, business improvement district, Union Square Partnership). Street Artists and Free speech protesters are at risk as the space becomes further privatized and constricted during construction and afterwards. *Washington Square Park – 11 mature trees have been destroyed in order to “align” the famous fountain with the historic Arch (no matter that they’d been unaligned for over a century). Naming rights to the Fountain sold by the City to the TISCH Family. More are headed for the chopping block. *Yankee Stadium – 400 trees were chopped down from TWO Parks in the Bronx (which desperately needs parks) which were destroyed to make way for the new Yankee Stadium. 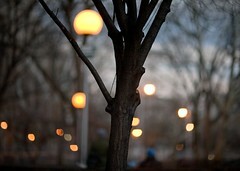 *East River Park – Over 105 trees axed to “reconstruct” the East River Park. *Highland Park/Ridgewood Reservoir – Thousands of trees are on the chopping block with Parks Commissioner Benepe’s plans to destroy the natural landscape and habitat here to install dangerous artificial turf in this spot on the Brooklyn/Queens border. Let’s stop the Bloomberg Administration’s continuous privatizing of our public space while destroying our City’s mature trees. I have no idea how NYC Mayor Michael (“No One’s Ever called me a Tree Hugger Before”) Bloomberg really truly deeply feels about trees but his MillionTreesNYC “initiative” strikes me as mostly bluster and p.r. 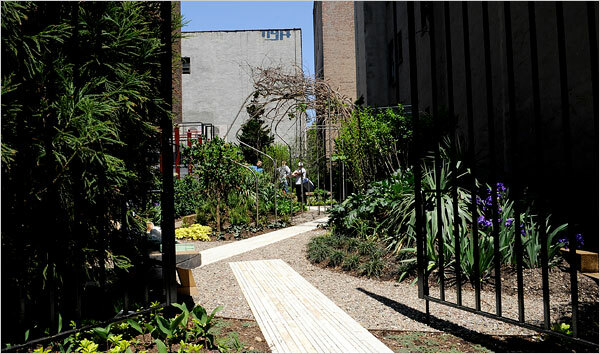 In case you missed the news, Mayor Bloomberg has designated April MillionTreesNYC Month. 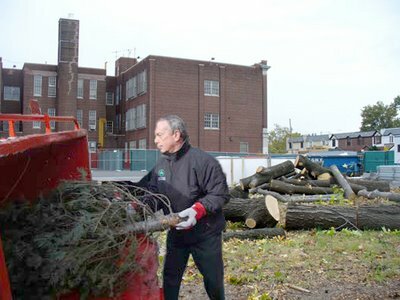 Assessing the # of trees that have hit the chopping block during his administration (with his Parks Commissioner Adrian Benepe), it becomes clear that when there is a chance to privatize or add a corporate interest to a public space, in Mayor Bloomberg’s book, it’s time for the fellows with the chain saws to move in. Nor is it how I think our city Parks Department is supposed to function — putting private interests over the care and stewardship of our city trees, open space and wildlife. You can read a previous entry on this here. *Thousands of trees at Ridgewood Reservoir/Highland Park in Queens to cover over the naturally occurring landscape with Benepe’s favorite dangerous synthetic material: artificial turf. *Thank you to the Queens Crap blog for unearthing this Bloomberg photo. They cover steadfastly the craziness that too often represents our city government and how it relates to the over-development of the borough of Queens, in ways that affect us all! Washington Square Park and Union Square Park are both in the midst of redesigns by New York City. There are some striking similarities in how these controversial plans of two historic parks initially got pushed through despite community disapproval and widespread negative public opinion. At Washington Square Park, the background is a bit murkier as far as who initiated the discussion with the Parks Department but most everyone agreed that the Parks Department had let the Park fall into disrepair and it needed some basic fixing (roads repaired and cracks in paths paved) and a tune-up. At Union Square Park, in 2002, City Council Member Margarita Lopez was able to allocate $1.9 million from City funds expressly for the improvement of two playgrounds on both sides of the pavilion (on the north end). Note: Community Boards votes are largely “advisory” and are not binding in any way. However, they are utilized in the court of public opinion and it is considered important for City Agencies to gain their approval. City Council Members like to point to their approval – when it suits them. After numerous rounds of meetings with the NYC Parks Department about Washington Square Park’s “renovation,” the community discovered that the presentations omitted key information: that there was a major reduction in the amount of public space based on the redesign plan; that the Tisch Family had been given naming rights to the historic fountain; etc. The aspects that make Washington Square Park historically a free speech gathering place and a great overall public space were treated with disdain by the Bloomberg Administration. Their plan is to cut away public space to control public gatherings and un-permitted performances. They are ruining the historic nature of the park, dismantling the large circular Fountain, which also serves as a public rallying venue, rebuilding it in a smaller version eight yards away with vast reduction of the ad-hoc seating and renaming it (a plaque on each side) for the billionaire Tisch Family. The Union Square Park Pavilion’s history is primarily known as the space where numerous political demonstrations occurred. The first Labor Day Parade in 1882 ended up at the northern end of Union Square at the Pavilion. At Washington Square Park, repairs could have been accomplished with the $6 million the Parks Department allegedly had on hand for Washington Square Park but instead a $16 million budget was put into play with financing by the Tisch Family ($2.5 million) and NYU ($1 million). Current “designer” of the redesign, George Vellonakis, is on the record as stating that half of the money will come from private donors. Thus far, no others have been named but the budget for Phase I alone has skyrocketed from $6 million to $13 million. The $1.9 million that Council Member Lopez secured for Union Square Park has never been spent. In 2004, Mayor Bloomberg himself (and greeted by hecklers) “announced the city would kick in $8 million* to fund a new $14 million renovation of the entire north end.” It was announced that “the balance (was) being paid by the Union Square Partnership, the area’s business improvement district, which currently helps take care of the park.” (Metro, January 25th, 2007) *The City’s contribution is now $11.75 million and the entire project is projected at $20 million. In addition, an “anonymous donor” has given $5 million towards the project, contingent on a restaurant being in the pavilion. (New York Times, January 28, 2007) The Parks Department of course insisted initially that there was no such stipulation but the truth has since been revealed. Presently, Washington Square Park is scheduled to lose 23 percent of public space around the historic fountain. Union Square Park will see a widening of the street at 16th, and a reduction of the space allocated to the famous GreenMarket (The GreenMarket was interestingly enough founded by Parks Commissioner Benepe’s father, Barry) – largely responsible for helping revive the area and neighborhood – as well as reduction of green space around Pavilion and chopping down of numerous trees (see next item). In Phase I ALONE of the Washington Square Park redesign, up to 16 trees in the Northwest Quadrant have been deemed ‘in the way’ of the city’s plans. Thus far, 11 have been axed. There is no word on what tree destruction will happen during Phase II. At Union Square Park, 14 trees are inexplicably headed for the chopping block to expand the restaurant space at the Pavilion. Controversial designer of the “aligned” version of Washington Square Park, George Vellonakis, is allegedly on the board of the Greenwich Village Society for Historic Preservation which strangely enough took no position on the redesign of this landmarked historic Park, while seemingly taking strong positions on every other issue of redesign in the Village. At Union Square Park, Restauranteur Danny Meyer — who is likely to helm the proposed restaurant at Union Square Park — is also co-chair of the Union Square Partnership (a BID – business improvement district organization) which is putting up a large part of the money to redesign the north end of the Pavilion. There are many other aspects to Washington Square Park’s muddied approval “process” that we will go into at another time (“The Gerson-Quinn Agreement,” the Landmarks Preservation Commission and Arts Commission approvals, etc.) but they don’t apply to what happened – thus far – at Union Square Park. There are enough similarities and alarming details outlined above without adding anything else at the moment. The New York City Council Parks Committee held Preliminary hearings on the Parks Department budget yesterday, March 19th. My testimony follows. We would have liked to have heard some hard hitting questions from the City Council members to Parks Commissioner Adrian Benepe but that did not occur. Perhaps we can work on this for the Final Budget hearings in May. Note: I would have liked to have covered the proposed tree destruction and privatization in Union Square Park, dangerous artificial turf in parks across our city, the attempted privatization of Randall’s Island, the mass destruction of trees for Yankee Stadium, etc. — I focused on Washington Square Park as I think it is representative of the Parks Department’s reckless abandon and I think it is an area in which the City Council needs to – and can – intervene. I am concerned about the Parks Department and the privatization of our parks but I’d like to specifically focus on what’s happening at Washington Square Park. The New York City Council needs to hold oversight hearings on what’s transpired at Washington Square Park. It should not be up to lawsuits to be the only method that holds the Parks Department accountable to transparency and honesty. The Parks Department did not reveal essential elements of their plans before going before local Community Board 2 and the Landmarks Preservation Commission – and gaining their initial approval. These are part of our checks & balances and if the information is flawed, then the process will be. The Parks Department went before the community stating that there would only be a 5% reduction in public space. The existing entire plaza is 51,223 square feet. The proposed plaza is 39,419 square feet. That is a reduction of 11,804 square feet. That is no five percent. That is a 23 % REDUCTION. The Parks Department is messing with the historic character of this Park which is a landmark. People come from all around to go to this park to see what is happening there each day and each day it is something different. The Parks Department sold off the naming rights of the fountain to the Tisch family for $2.5 million so that the fountain could then be called TISCH FOUNTAIN. Another fact not revealed to the Community Board. In addition, I’m sure you’ve heard that they are digging up 18th and 19th century burial grounds. They told the community they would only dig 1-3 feet below grade and they are digging 7-11 feet. Community Board 2 later rescinded its approval – something Commissioner Benepe does not recognize when he writes to City Council members who question his actions around the Park. Eleven 50-100 year old trees have been cut down thus far. It is not JUST, as Commissioner Benepe implied, about cavalierly cutting down old trees and planting new ones — it’s about being STEWARDS for the trees that are there. The Parks Department let Washington Square Park fall into disrepair and then swooped in with a disingenuous redesign that is unwanted by virtually everyone. The original plan called for the costs to be $16 million. Phase I (there are two Phases) was originally $6 million and is now budgeted at $13 million. Where is that money coming from? This allows for the further privatization of the park. I ask the City Council to hold hearings on this issue and apply further scrutiny to the Parks Department. –There’s some more we’ll post about what we learned about some other parks — particularly Ridgewood Reservoir in Queens – having major interference from Parks Department – which must be stopped – and some heart breaking details if the plan is allowed to go through. Interestingly enough, Ridgewood Reservoir (which I’d never heard of, and is on the Brooklyn-Queens border) was constructed in 1848 to provide drinking water to the city of Brooklyn! It was taken out of the water system during the late 20th century. According to testimony by advocates for the Reservoir, the Parks Department plans to destroy thousands of trees to build new synthetic turf ballfields on this pristine site. ! More on this to come. Did we mention we think the Parks Department needs some oversight? Phase I of the City’s extensive planned “renovation” of Washington Square Park has gone from a projected $6 million to over $13 million. The “renovation’s” TOTAL costs — in two Phases — were stated to be $16 million at the onset (an excessive sum to begin with) but are now lurching upwards to $25-30 million. Where will the money come from? Since most everyone believes that Washington Square Park could manage with a few repairs on a relatively minor budget, it seems like a tailor made scheme for future privatization of the Park. Of course, the elephant in the room is New York University whose advertising pitches and promotional materials all feature Washington Square Park’s Arch (a public space, last we checked) larger than life. On the subway the other day, I saw five ads across the car for NYU’s School of Continuing Professional Studies — the Arch was bigger than anything else in the ad. NYU is throwing in $1 million thus far for the “renovation” of the Park despite their insistence that they are “not involved.” We received a copy of a letter the University sent from their Community Affairs office to their “neighbors” recently. It stated that “the University believes it (the Park) has been in need of renovation for some time” … “though NYU had no hand in the specifics of the Park’s redesign.” ?? Now, I realize Mayor Bloomberg would not have a problem with this, but I do. I don’t want every last inch of public space corporatized and particularly not Washington Square Park. Other questions: Will the City set up a Conservancy and further privatize the park enabling them to hold exclusive ticketed events? Will they close off the Park to the public which, of course, will be easier once they erect their proposed four foot fence?